Panax ginseng saponins seem to increase serum cortisol concentrations and stimulate adrenal function. Panax ginseng might also increase dehydroepiandrosterone sulfate (DHEA-S) levels in women . It is also used for stimulating immune function, improving physical and athletic stamina, improving cognitive function, concentration, memory, and work efficiency. It is also used orally for depression, anxiety, Pseudomonas infection in cystic fibrosis, chronic bronchitis, irritated or inflamed tissues, and as a diuretic. Panax ginseng is also used orally for anemia, diabetes, gastritis, neurasthenia, erectile dysfunction, impotence and male fertility, fever, hangover, and asthma. It is also used orally for bleeding disorders, loss of appetite, vomiting, colitis, dysentery, cancer, insomnia, neuralgia, rheumatism, dizziness, headache, convulsions, disorders of pregnancy and childbirth, hot flashes due to menopause, and to slow the aging process. 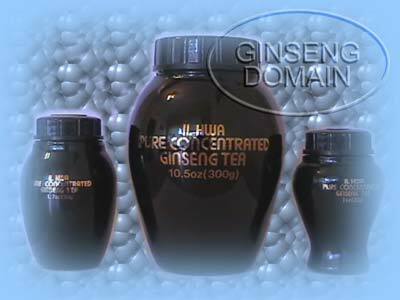 When you by Il Hwa Korean Ginseng you can be absolutely sure that you are getting the very best ginseng in the world. Panax ginseng is native to China and Korea. It is also known under following names: Asian Ginseng, Asiatic Ginseng, Chinese Ginseng, Ginseng, Ginseng Asiatique, Ginseng Radix, Ginseng Root, Guigai, Hong Shen, Japanese Ginseng, Jen-Shen, Jinsao, Jintsam, Insam, Korean Ginseng, Korean Panax Ginseng, Korean Red Ginseng, Ninjin, Oriental Ginseng, Radix Ginseng Rubra, Red Ginseng, Ren Shen, Renshen, Renxian, Sheng Shai Shen, White Ginseng. Ginseng extract, ginseng tea, and the root itself have a peculiar sweetness, accompanied by bitter undertones. The largest percentage of the root is starchy and contains small amounts of resin, volatile oil, and panaquilon, which is the main active ingredient of the root. Ginseng is widely used as a general tonic or "adaptogen" for fighting stress. There is some evidence that it might work against stress by affecting the hypothalamic-pituitary-adrenal (HPA) axis.